Pixel Scroll 11/22/17 By Jove, Who Scrolled The Quartz Monkey Pixel Fudge? (1) WORLDCON 76 HOTEL RESERVATIONS. Worldcon 76 emailed the passkey to members today and opened reservations today at 1 p.m. Pacific time. Worldcon 76 members reserved over 4000 room nights since we distributed the reservations link this afternoon. The Marriott and the Hilton, the two hotels directly connected to the CC, and the least expensive of the official hotels, almost immediately became unavailable, presumably due to being booked up. The Fairmont, the party hotel ($199/night), The Hyatt Place, Westin and The AC Hotel by Marriott remain available on the convention dates (Thursday-Monday) at this writing. However, when I added Wednesday to my request, only The Fairmont was available. (2) NEW “NOTHING TO READ” UPDATE. North Carolina schoolteacher Becky Sasala (sister of John Joseph Adams) has received hundreds of donated books for her classroom library since her appeal was posted in September (item #2). (3) NEW HUMBLE BOOK BUNDLE. The “Humble Book Bundle: Stellar Sci-Fi & Fantasy by Tachyon” is offered for a short time at the usual pay-what-you-want rates. Pay more, unlock more books. If they need a laugh after this garbage fire of a year, then get them season one of The Good Place, because we’re all messy humans, we’re all caught up in stupid systems beyond our control, and we all could use some frozen yogurt. If they’re still ride or die for Game of Thrones while simultaneously nursing a bitter resentment over how much better this show could do by its female characters, then get them the Skyrim Special Edition and let them live their own high fantasy adventure. It’s got all the time-sucking goodness of the original game, but the art’s gloriously remastered, the DLC’s unlocked, and the bugs are (mostly) fixed. If they aren’t religious but love the winter holidays for symbolizing love and kindness in the face of the freezing dark, then give them The Bonobo and the Atheist by primatologist Frans de Waal. It’s a thought-provoking, perspective-altering, brain-calming book about compassion as natural instinct…. …The Hollywood Reporter piece cited one woman as saying Lasseter was prone to “grabbing, kissing, making comments about physical attributes.” Another woman said that Lasseter’s statement Tuesday that centered on hugs minimized the alleged offenses. Many of the accusers were anonymous. The story said that the writer-actor Rashida Jones had left “Toy Story 4” because of Lasseter’s behavior. But she and writing partner Will McCormack later issued a statement that “we did not leave Pixar because of unwanted advances. That is untrue.” They said instead that diversity concerns played a role. “There is so much talent at Pixar and we remain enormous fans of their films. But it is also a culture where women and people of color do not have an equal creative voice,” they wrote. (6) BLABBING FOR DOLLARS. SyFy Wire says “J.J. Abrams is selling Star Wars spoilers for a good cause”. When J.J. Abrams directed Star Wars: The Force Awakens, he was his usual secretive self right up until the end. But something seems to have changed in the Star Wars/J.J. Abrams universe since he was tapped to direct Star Wars Episode IX. He’s now selling Star Wars spoilers to the highest bidder. After Ron Howard’s masterful use of social media when it came to getting fans engaged with Solo: A Star Wars Story, Lucasfilm’s Kathleen Kennedy announced a shift in the company’s attitude toward sharing more information with the fans, and we even saw a verified Twitter handle pop up for Abrams (no tweets yet, but we remain hopeful), but J.J.’s appearance on HBO’s Night of Too Many Stars definitely qualifies as a new development. To help raise money for autism, J.J. offered up the plot of Star Wars Episode IX to one lucky bidder. What happened next? Well, you’ll just have to watch…. (7) UNLIKELY PAIR. Yahoo! Entertainment writer Gwynne Watkins, in “‘Star Wars: The Last Jedi’: 7 things we just learned”, summarized the Entertainment Weekly issue devoted to the film, and says that a reunion between Luke and Leia is highly unlikely and General Leia’s successor is her childhood friend Admiral Holdo, played by Laura Dern. One of the biggest questions for longtime Star Wars fans is whether estranged twins Luke and Leia will find one another in The Last Jedi, since Carrie Fisher died before shooting any scenes for Episode IX. (Lucasfilm has said they will not digitally recreate the character to conclude her storyline.) EW won’t say either way, but their coverage suggests that a reunion may have been planned for the third part of the trilogy, which is slated for 2019 and hasn’t begun production. 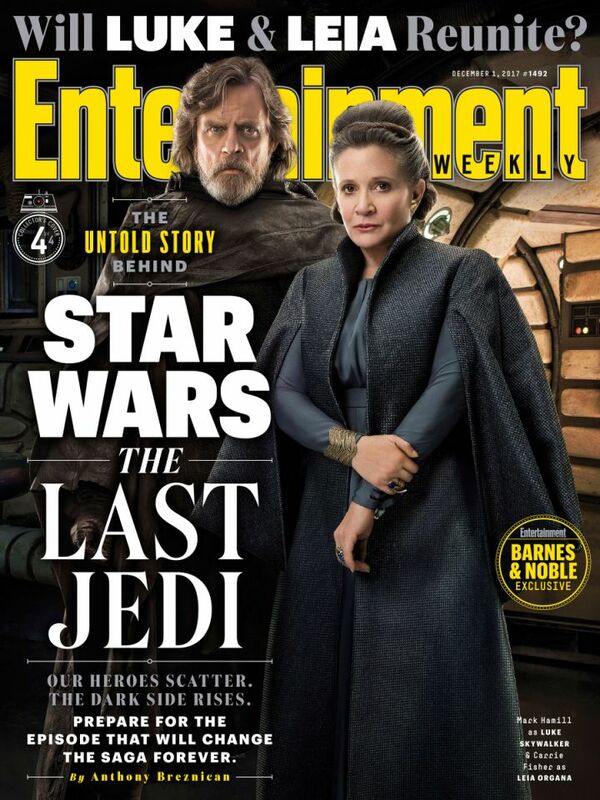 Nevertheless, director Rian Johnson chose to pair Luke (Mark Hamill) and Leia on one of EW‘s four covers. “It’s nice seeing them on the cover though. Even if all we have is that,” Johnson told the magazine. According to Wikipedia (so it MUST be true! ), the movie cost $1,968,000. It took in $2,765,000 at the box office. So Robby alone has earned nearly double what the film earned. (9) TWENTY THOUSAND LEAGUES FOR FORTY THOUSAND BUCKS, Another sff treasure sold at yesterday’s auction was “A Harper Goff scrapbook pertaining to 20,000 Leagues Under the Sea”, for $40,000 including premium. Titled “A history in informal photography,” this is production designer Harper Goff’s personal scrapbook documenting every stage of the making of his masterpiece, Walt Disney’s 20,000 Leagues Under the Sea. This is a mother lode of original artwork, rare photographs, and ephemera from the film, curated throughout with Goff’s handwritten captions. 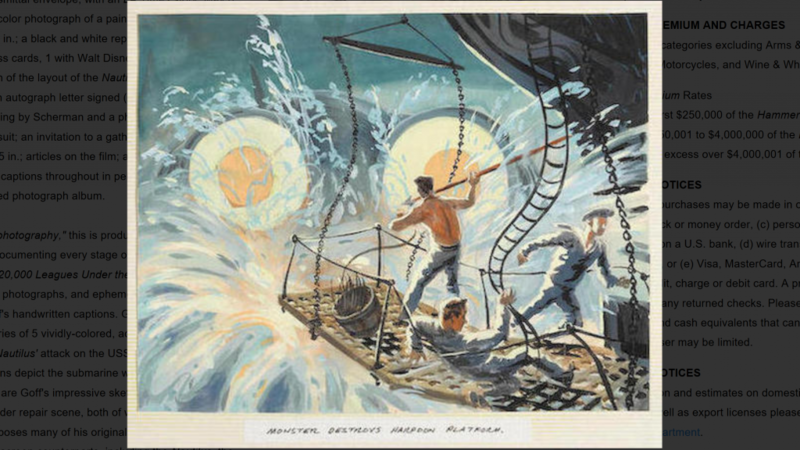 Goff’s original art in this lot includes an incredible series of 5 vividly-colored, action-packed sequential paintings of the submarine Nautilus’ attack on the USS Abraham Lincoln. (10) PHOENIX EVENT CANCELLED. From Nerdvana we learn — “LepreCon 44 cancels 2018 Phoenix Science Fiction and Fantasy Art Expo”. The Phoenix Science Fiction and Fantasy Art Expo, which was scheduled for March 16-18, 2018, in conjunction with and presented by LepreCon 44, is apparently canceled — but may be retooled. …According to the group’s Facebook page and website, “LepreCon 44, in the form of the Phoenix Sci-Fi & Fantasy Art Expo, which was scheduled for March 2018 at the Unexpected Art Gallery, has been cancelled. LepreCon, Inc. is no longer associated with any event of that name. (11) UNDER THE HAMMER. 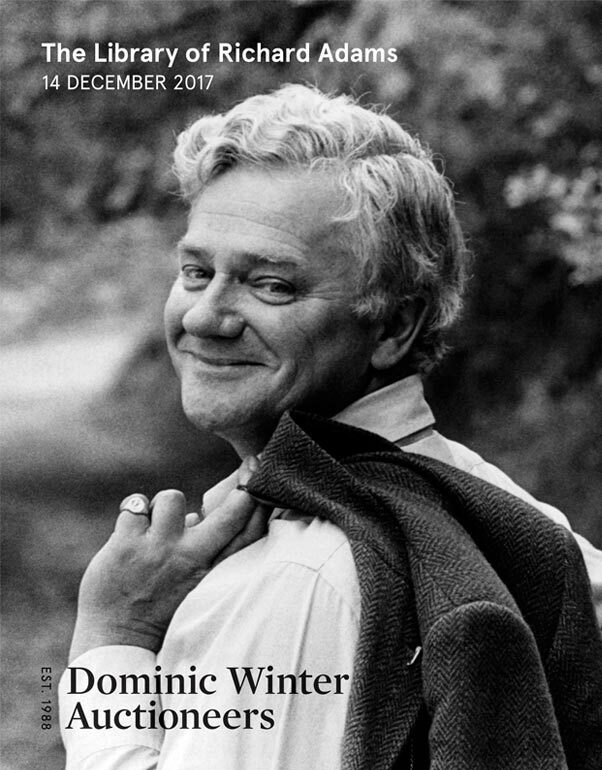 Dominic Winter Auctioneers will be handling the sale of The Library Of Richard Adams on December 14. The catalog is now available in print and online. Comprising 1500 books sold singly and in groups in a total of 134 lots, the antiquarian highlights include a Shakespeare Second Folio, 1632, a uniformly calf-bound set of the first editions of Jane Austen, a very rare first edition of John Milton’s Lycidas, 1638, and a two-volume first edition of Samuel Johnson’s Dictionary, 1755. Among the highlights of the children’s books are first editions of Alice in Wonderland, Wind in the Willows and the four Winnie-the-Pooh books. Adams’s deep interest in the history of English literature, poetry, nineteenth-century fiction and country matters is also reflected throughout the collection, many of the highlights of which bear his bookplate. We get there alongside young Miguel (voiced by Anthony Gonzalez), who lives with his shoemaking family in a Mexican village. He’s a happy kid, except for one thing: His family has lived an entirely music-free existence for three generations. His grandmother (Renee Victor) has forbidden it all — no blowing into soda bottles, no listening to passing car radios and absolutely no mariachis. Miguel knows why. Years ago, his musical great-great-grandfather grabbed his guitar and left, never to return. On Dia de Muertos — the Day of the Dead — when it’s said the deceased return to visit their families, no one so much as mentions great-great-granddad. Which means Miguel gets a bit of a shock when he strums a guitar in a cemetery on that day and finds himself and his street puppy Dante — get it? — transported to the land of the dead. The biggest problem with most urban fantasy is that, by nature, it becomes alternate history. It’s Renaissance Italy, but with vampires. Or Victorian England, but everyone wears cool goggles and has an airship! And there’s nothing wrong with that. There are stories out there that have done wonders with their skewed versions of our shared past. I’m just saying it’s rare for a writer to be able to do one (insert a fantasy element into a historical setting) without doing the other (letting the dragons eat the townsfolk, thereby giving rise to Bert the Dragonbasher, hero of West Crudwell, or whatever). And when someone pulls it off as well as Molly Tanzer in her new novel, Creatures of Will and Temper, it’s worth checking out just to see the restraint and careful worldbuilding gymnastics required. Honestly, if that was the only thing Tanzer accomplished here, I’d be impressed. She has created a Victorian England which is, in all noticeable ways, exactly the Victorian England we know — the mother of our modern world, by turns smoky, smutty, gross and backward, then beautiful, wondrous and louche with the turn of a corner. And yet, embedded in it — woven so closely into the fabric of normalcy that almost no one can see it — Tanzer has given us … demons. (14) DON’T SPARE THE ROD. John W. Campbell would have been thrilled to hear it: “U.K. Water Companies Sometimes Use Dowsing Rods To Find Pipes”. Most of the major water companies in the United Kingdom use dowsing rods — a folk magic practice discredited by science — to find underwater pipes, according to an Oxford Ph.D. student and science video producer who accidentally discovered the practice is still in use. Ten out of the U.K.’s 12 regional water and sewer utilities confirmed to Sally Le Page that they at least occasionally use dowsing rods, also known as divining rods or “witching sticks,” to locate underground water sources. Many of the companies later emphasized that dowsing is done by individuals, not as a company-wide policy, and that it does not cost any money. Le Page began asking water companies about the practice after her parents told her that they saw a water technician holding “two bent tent pegs” to decide how much of the road needed to be closed off. Le Page was incredulous and started asking water companies if this was an actual practice they used. (15) FREQUENT VISITOR. It’s been in and out of Europe multiple times: “Plague reached Europe by Stone Age”. Plague was present in Europe during the late Stone Age, according to a study of ancient remains. Writing in Current Biology journal, researchers suggest the deadly bacterium entered Europe with a mass migration of people from further east. They screened more than 500 ancient skeletal samples and recovered the full genomes of plague bacteria from six individuals. These six variously date to between Late Neolithic and Bronze Age times. The plague-positive samples come from Russia, Germany, Lithuania, Estonia and Croatia. “The two samples from Russia and Croatia are among the oldest plague-positive samples published. They are contemporary with [a] previously published sample from the Altai region [in Siberia],” co-author Alexander Herbig from the Max Planck Institute for the Science of Human History in Jena, Germany, told BBC News. The plague bacterium, Yersinia pestis, was responsible for several major historic pandemics, including the infamous Black Death in the 14th Century, which is estimated to have killed between 30% and 60% of Europe’s population. This entry was posted in Pixel Scroll and tagged Becky Chambers, Disney, Humble Bundle, J.J. Abrams, LepreCon, Molly Tanzer, Phil Nichols, Pixar, Pornokitsch, Richard Adams, Robby the Robot, Star Wars, Twenty Thousand Leagues Under the Sea, Worldcon 76 by Mike Glyer. Bookmark the permalink. 3: The Brandon Sanderson book in the Humble Bundle isn’t available in the UK for some reason. 1) It is dying. Dying, I say. Anthony: The Brandon Sanderson book in the Humble Bundle isn’t available in the UK for some reason. Strange. In theory Humble Bundle should know that I’m from the UK but they’re allowing me to download the Brandon Sanderson book. Then again my IP address is in Thailand right now so maybe that’s how they track it? Although why Thailand is ok is anyone’s guess. @JJ: Thanks but, ummm, errr, Ooh look, something Shiney! Not surprised about the news item regarding “Leprecon 44”, which would have been no such thing. The plans for it seemed to throw away nearly all the social benefits a convention provides. (No hotel, no parties. No nearby parking. Extra charges for some of the panels?) My reaction to the initial flyer was “WTF?” I did not purchase a membership. Pretty common reaction, it seems. Heard at TusCon that less than a dozen memberships had been sold, but that may be just a guess, since I also heard the chairman wouldn’t give out any actual numbers. UK and Commonwealth rights to the Sanderson belong to Gollancz, I think, so Tachyon can’t give it away there. Thailand should be OK. I am in Australia but VPN > geoblocking so I acquired it for only a couple of extra mouse clicks. Surprised to see the two Hap & Leonard books in a SF and Fantasy bundle. Anyone read them? Other H&L novels are definitely not SFF. Not adjusted for inflation, because the numbers wouldn’t be so impressive. Happy Thanksgiving, everyone! My contributions this year will be cranberry-habanero chutney and pecan pie; and I’m planning to sit in my brother’s car & read Dragonlance novels on my Kindle while en route to my parents’ place. The New York Times Book Review has picked their 100 Notable Books of 2017. A number of genre- and genre-adjacent picks, including Jemisin’s The Stone Sky, LaValle’s The Changeling, and Edmund Gordon’s The Invention of Angela Carter: A Biography. Autonomous: A Novel by Annalee Newitz is on sale in Kindle format in the US for $2.99. I seem to recall some praise for that here and may just grab it today. Here in 8825, Mt. TBR is twice as tall as Mt. Denali. *SIGH* In 0021, I remember to check the box. (1) So happy that we live a short drive from downtown San Jose. No way in hell we could afford even the con rate prices. Sleeping in our own bed is a bonus. That’s going to be a fun week. Four days after the con ends we head out for Burning Man. Happy Thanksgiving, and if you aren’t serving the cranberries in the perfect shape of the can, you’re doing it wrong! @MrDalliard: well that explains it. I’m quite fond of my VPN, too. Here’s hoping all Filers have a great day, whatever you choose to be celebrating/commemorating. Many, many immigrants to these shores (first gen and later) will be celebrating Thanksgiving, while many indigenous people will be commemorating Unthanksgiving or National Day of Mourning. I think it is important to remember that there are at least two sides to this coin. Over the years I have frequently castigated people for wishing me a “Merry Christmas” for being insensitive, for being discourteous. Since delving deeper into the National Day of Mourning (via a piece on NHPR), I have come to realize that I’ve been guilty of the same thing when wishing others a happy Thanksgiving. I now wish them a fine day for getting together with family and friends. It’s not PC. It’s not bleeding heartism. It’s recognizing that everyone can and probably does have a different perspective on things and being respectful enough of our fellow citizens to understand this, and to incorporate it into our daily discourse. Joe H.: Happy Thanksgiving to you, too! Steve Davidson: I think it is important to remember that there are at least two sides to this coin. There are 365 days in a year. If someone has decided to turn the fourth Thursday of November into their day or mourning, instead of a day to give thanks, they have chosen it for publicity, and why should I allow myself to be manipulated? Single, green pixel is looking for a scrollmate! Just finished Borne. Mmh, its good, but not great. While I totally loved the Southern Reach triology, I had difficulties getting invested in this book, despite a deep narrator. But the scenario was just to bizarre… In annhiliation you had normal characters, trying to understand a strange world. Here you have characters, who already understand an even stranger world. That makes it more difficult to suspend the disbelieve imho. If someone has decided to turn the fourth Thursday of November into their day or mourning, instead of a day to give thanks, they have chosen it for publicity, and why should I allow myself to be manipulated? What exactly are they giving thanks for? They have chosen it because it’s a day that, to them, is effectively about white people celebrating their genocide. It’s not even remotely fathomable to me why they should care in the slightest how anyone else feels about their choice of day. @August & Mike G: Mike, In was a bit surprised at your response. August – yes, that’s what I was referring to. Happy Thanksgiving (a little background on how marketing made the “traditional” meal in the U.S.) and/or Happy Thursday and/or Happy Some Other Concept, depending on where you’re from, where you are, and what you prefer. I was raised that Thanksgiving’s a day to give thanks and overeat, though the “yay, a day off!” aspect maaaay have eclipsed the “give thanks!” part for me, I suppose. Of course, I don’t need an excuse to overeat, hmm. @Lace: Yay, another book list! Another SFF one is Lincoln in the Bardo (I know little about it, but have seen it mentioned in SFF circles) and The Power (which has gotten praise from some Filers). Awesome that they put The Stone Sky on the list; I’m guessing it’s rare for them to put a third-in-SFF-trilogy book on the list. It’s not publicizing like linking up the day after you give thanks as a huge commercial sale enterprise. it’s publicizing the explicit rewriting of history. We can be thankful and mourn the departed. If anyone hasn’t read Charles Mann’s 1491 and 1493, seek them out. I learned things that I never expected, and I thought I already knew a fair amount about Native Americans and the Columbian Exchange. It helps put things in context. The Pilgrims who celebrated what is traditionally the first Thanksgiving in 1621 didn’t genocide anyone. They themselves had been persecuted for their religion, and the ones still alive in the Fall of 1621 had seen more than half of their original group die to disease and privation over the previous year. The were thankful simply to be alive. (14) Interesting that dowsing is in the news once again. My late grandfather, a very level-headed type who scoffed at most alleged supernatural phenomena, always thought that dowsing was real; he said he had seen it done successfully too many times to disbelieve it. His theory was that some people are sensitive to magnetic currents in the earth, which are altered by the presence of water. The sticks and such are mainly just window dressing, although they may also help the practitioners focus their perceptions. The Pilgrims settled at the site of a former thriving village. They didn’t really have the right to settle there, but there was nobody to oppose them – the local natives had died in a virulent smallpox epidemic. The Pilgrims broke into native graves and took corn that had been left as grave goods. They planted fields that had been cleared for them by the dead. I think it’s appropriate to give thanks to the spirits of the dead, and to pray for their forgiveness. “Dowsing” is just an ideomotor effect. Under controlled conditions, it doesn’t work. @P J Evans: if there was a visible hose, it wasn’t dowsing — regardless of whether the water was running. August: What exactly are they giving thanks for? They have chosen it because it’s a day that, to them, is effectively about white people celebrating their genocide. It’s not even remotely fathomable to me why they should care in the slightest how anyone else feels about their choice of day. This resonates very strongly with the typical puppy argument that they don’t care what people think — even though they are spending time talking about what people think. On Thanksgiving I’m taking a particular opportunity to celebrate and express gratitude for life, family, religious freedom and many other things. Columbus Day is already being refashioned as a day of shame and guilt, and I’m sure in some minds every United States holiday can be bent in that direction with only the slightest effort, but it would be better to avoid that particular trend if people of goodwill want to live together. It was dowsing – for fun, that time – but it does work for some people. My grandfather also claimed he could dowse. I never saw him do it – he died when I was 9 – but my Mom did. Coincidentally, I tried my luck at dowsing in an experimental set-up similar to the video Aaron posted. Zero success. So even if my grandfather really could do it, I clearly didn’t inherit his ability. Funny how it never works for anyone when tested under controlled conditions. Funny how a lot of stuff that works fine in lab tests doesn’t work in the field. Which is the critical factor. It’s not obvious to me that the people who are refashioning Columbus Day and Thanksgiving are, in fact, people of good will. Which is part of the problem.